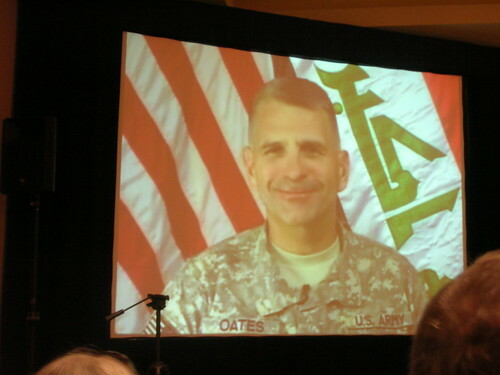 Major General Oates joined the Milblog conference to tell bloggers how he uses blogging as a leadership tool. From his standpoint, future leaders would be ignorant not to use this forum. He has used his blog, Task Force Mountain, as a way to take the pulse of this troops and their families. He has used comments from soldiers, spouses and veterans to make improvements to Fort Drum. Oates finds that people, especially soldiers are more candid in their responses in the comments section of a blog entry than they would be to his face. A father of three daughters in their 20s, Oates said he wanted to open a more effective way of communication with his soldiers. He saw how his daughters used the internet and blogging to communicate with their peers. With majority of his soldiers about the same age as his daughters, he decided to start blogging. He pointed out that other flag officers might not be as comfortable using a blog as a form of communication because they are uncomfortable with the technology. "You're dealing with a bunch of 45-55 year old officers who are uncomfortable with blogging because they don't understand the medium, because they didn't grow up with it."